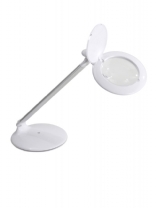 Discrete pocket LED magnifier to read on the go. Perfect to read small print. 2 YEARS WARRANTY. 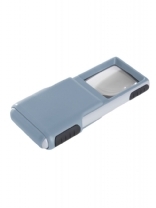 This compact foldable pocket LED magnifier is ideal to carry in your pocket. 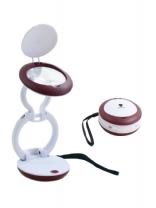 The magnifier has an 8 Diopter 3.0X Lens and 3 bright daylight LEDs. Requires 3 x AAA batteries (not included). 2 YEARS WARRANTY. Foldable and compact, all-purpose, lightweight table magnifier providing 5 diopter (2.25X) magnification with a 12 diopter (4.0X) inset lens. Taking up a small place on your desk but powerful enough for working on projects that need close to details. 2 YEARS WARRANTY. 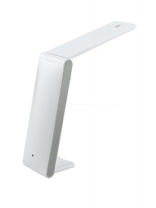 The portable LED Foldi™ Lamp features 30 bright daylight™ LEDs to give you comfortable full-spectrum natural daylight which is kind to your eyes, reducing glare which helps reduce eye strain, headaches and red-eye. Up to 8 hours batteries. USB power alternative. Portable & Lightweight. 2 YEARS WARRANTY. 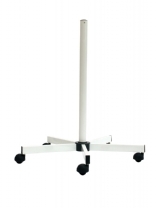 5 Spoke Floorstand. Height: 80 cm (31.5"). 2 YEARS WARRANTY. Compatible With: All Daylight Magnifiers. 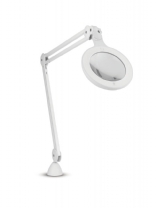 The Omega 5 Magnifier is a modern, ergonomically designed magnifying lamp. 2 Year Warranty.